Green roofs are growing in popularity across the U.S. because of their obvious aesthetic appeal and additional economic benefits, such as helping manage stormwater, reducing the heat island effect, and adding value to buildings. A green roof is defined by the Green Roofs for Healthy Cities (GRHC) organization as a system that’s an extension of the existing roof. The extension includes high-quality waterproofing, a root repellent system, a drainage system, filter cloth, and a lightweight growing medium and plants. But here at LawnStarter, we like to call them pretty roofs with flowers on top. Despite the added benefits listed above, green roofs are having a hard time puncturing the single-family home market. According to Kara Orr, marketing coordinator for GRHC, multifamily residential properties, such as apartments and condos, made up about 22 percent of reported green roof projects in 2015, while single-family home projects accounted for just 1.7 percent. Among reported residential projects, multifamily projects represented 93 percent while single-family homes represented just 7 percent. But exactly how much of a difference does a green roof make? A green roof will absorb rainwater (up to 80 percent) and reduce the chance of flooding, especially if your gutters typically overflow with runoff. Green roofs double (sometimes even triple) the life of a roof, which grows brittle and cracks from too much sunlight. By soaking up the sun’s rays, a green roof can help reduce temperatures by 6 to 8 degrees and lower your utility bills. Green roofs pair well with solar panels. Below, we rank our favorite green roofs for single-family homes. Designed by: Shepherd Resources Inc.
Why we like it: The roof seamlessly meshes with the landscape around the property and camouflages the house. Why we like it: The maturity of the roof’s foliage and the abundance of lighting make the house seem like it belongs in a fairytale. Why we like it: This design scores points for having vibrant plant life along with solar panels. Double the efficiency! Designed by: Hammond & Company, Inc.
Why we like it: Another example of a well-put-together color palette, with the addition of solar panels to go that extra mile. Why we like it: This design is the perfect example of keeping it simple yet classy. 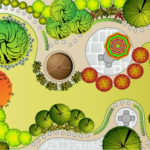 Designed by: Constructive Solutions Inc.
Why we like it: Have you ever seen such undisturbed green lolling over the hills? No one should interrupt that elegance with a roof made of shingles. Why we like it: Style points for the blue rock border and the clustered coloration of the sedum. Why we like it: This home allows its tenants to enjoy a colorful garden while sitting on their rooftop patio. Why we like it: We’re huge fans of “The Hobbit,” and that’s about as creative as it gets. That wraps up our picks! Feel free to share your thoughts in the comments section below.